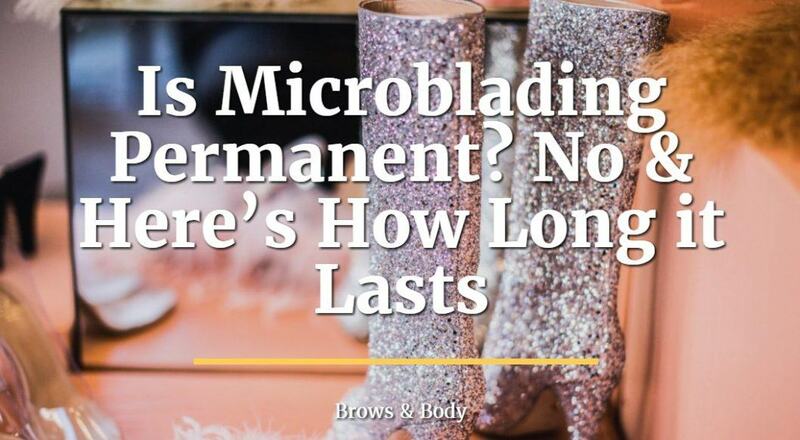 This post will help you understand how long microblading lasts, if it is permanent and how to determine if it's a good idea for you to get this cosmetic procedure done! Before we jump into why it isn't permanent it's important for you to know that microblading is NOT permanent (more on that below, but just to get it out of the way). This is actually a question that I get all the time. Many women (and some men too) see the results that other people are getting with microblading and their initial impulse is to get it done! This isn't necessarily a problem, but I think you should take pause for a few minutes and think about it. While microblading is NOT permanent it does last quite a while, and unless you get it done by a talented artist there is a small risk that you might not be happy with your results. This puts some people in a tough situation! So what exactly is microblading and why isn't it permanent? Microblading should be differentiated from tattooing which IS permanent. A tattoo is different from microblading in that a tattoo goes DEEPER into the skin and into an area known as the dermis. 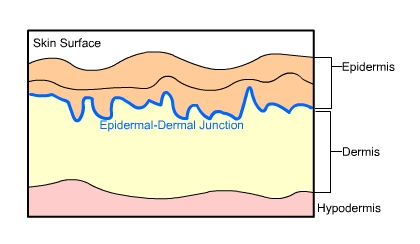 Microblading does NOT go that deep and enters into a place in the skin known as the dermal epidermal junction. Because microblading enters the dermal-epidermal junction it means that your body will eventually "push" out the pigment over time. You can compare this to tattoos which may slightly fade over time but they are ALWAYS going to be there (unless you get laser removal therapy). Because of this microblading is known as a "semi-permanent" cosmetic procedure. So what basically happens is that some pigment is placed at about a medium depth in the skin which will eventually fade over time and on its own. It's considered semi-permanent because this pigment will be there for an intermediate length of time (about 12-15 months if you get it done right). During this time it will appear like a tattoo does, meaning you will see the pigment and the strokes, but it WILL eventually fade over time. So How Long Does Microblading Last? If you have any interest in getting microblading done then you should know exactly how long it will last. This is important because it can help guide your decision to help you know if this is a procedure for you. 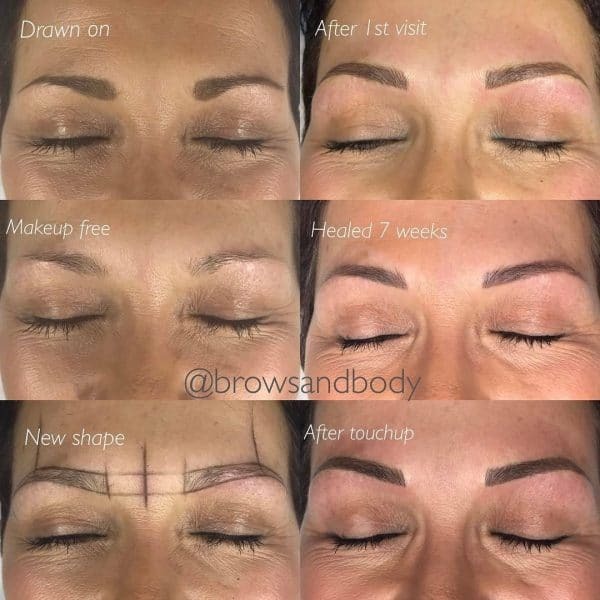 Unlike a tattoo which you only pay for up front, microblading will require a touch up (more on this below) in order to continue on with your results - which means it will cost more long term. You can think about a touch-up as a quick refresher in which your artist will re-apply the microblading strokes and continue to put pigment into your skin. This process is really considered an integral part of the microblading procedure and a step that shouldn't be skipped. So under normal circumstances you would go in for your initial appointment (which is generally 2-3 hours long) and then you would recover from this for about 4-6 weeks. During this initial procedure your artist will lay down pigment and you will walk out with some pigment on your face and brows. This pigment that was placed will naturally fade in about 3 months UNLESS you get your touch up. This is kind of a good time frame for people to get used to the "new look" that they have and allows them to determine if they do indeed want to keep their brows looking a certain way. It's also an important time for you to determine if you want to make any changes. Sometimes the shape of your brows can be altered at the touch-up to fit your idea of what you want them to look like. But what's important here is that the actual procedure of the touch-up helps "solidify" your results and helps them last even longer. So if you only get the initial microbladed procedure you can expect your results to last around 3-6 months. If you go back in about 6 weeks to get your "touch-up" then you can expect your results to last even longer - around 12-15 months. Other factors will influence the length of time that your results will stick around such as people who have naturally oily skin. Those people who have naturally oily skin will probably only see their results last up to 9 months or less unfortunately! If your artist doesn't go "deep" enough into the skin then your brows will naturally fade faster as the body pushes the pigment out of the skin. If the pigment is placed in the epidermal area (which is not very deep) then your body will probably kick out all of the pigment over the course of 60 days or so which is the natural life cycle of your skin! If you want your results to last as long as possible then I encourage you to follow the after-care instructions from your artist as close as possible! If you decide to look into getting your brows microbladed you will want to look closely at the before and after pictures of each artist! Make sure that you find examples of brows done immediately after the initial appointment but also brows done after the touch-up so you can compare. You also want to make sure that you see a finished result. Some artists may produce amazing results immediately after the appointment but if they don't get the right depth or use the right pigments then the results may fade rapidly. Because of this it's always a good idea to look for after pictures (around 3 months) of the touch-up. Look for before and after pictures that show ALL of the stages of microblading, including a head on shot of the brows. This will help you determine if the brows are symmetrical and even as well. One of the worst things you can do is go to an inexperienced microblader! This is your face we are talking about and they are putting a sharp blade and pigment into your skin. Many women have had poor results by going to inexperienced microbladers and have been in a situation where they want to fade their brows as quickly as possible. If you fall into that category you can read more about fading your brows here. What are you concerns, if any?